4 Person Hot Tub. Large Screened In Porch. 3 Miles from Town of Laurie. Planted Crappie Beds. 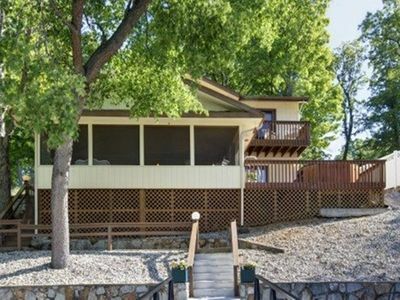 Ideal family retreat - lakefront with great view, large screened porch, and hot tub. 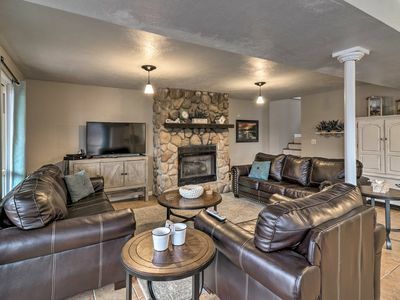 This wonderful family retreat is the last home in a small subdivision. 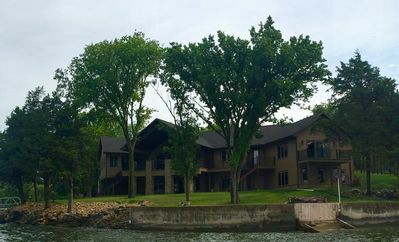 The back lot is heavily wooded adding privacy and yet the home takes in an expansive view of the cove and main channel - 39 mile marker of the Osage. 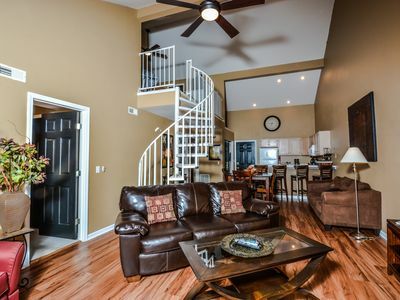 The two story home has an open living floor plan with three bedrooms and three full baths. Guests enter the Hill Crest home through the entry foyer and have the option of retreating to the upstairs bedrooms or going downstairs to the main living area. Upstairs are three spacious bedrooms, each with a view of the Lake. 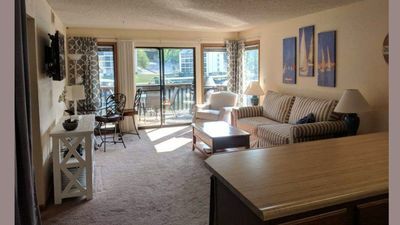 The master bedroom has a king size bed with a full size shower bath and private lakefront balcony. The second and third bedrooms are set up with queen and twin size beds and share the hall bath (full size with shower tub). 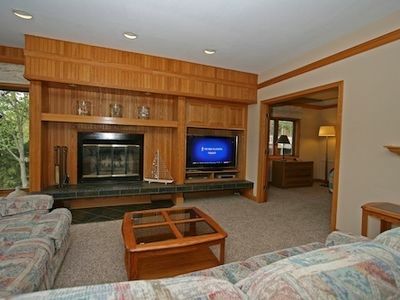 Downstairs is the living room and it’s expansive fireplace wall two sofa sleepers (full) and entertainment unit. 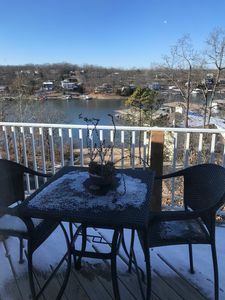 The dining area sits directly behind the living room, takes in it’s own view of the lake and is just steps away from the wonderful u-shaped kitchen. The hallway off the living room conceals a laundry work area and third full size bathroom. 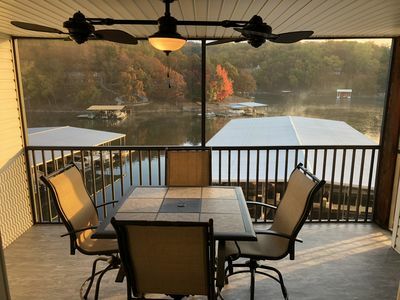 Everyone will enjoy the spacious lakeside screened in porch that is directly off the living room, Guest will certainly enjoy this protected outdoor space for putting together a puzzle, relaxing outside during a summer rain shower or reading that newly purchased best seller book. Guests will have access to several wonderful exterior features of this property. 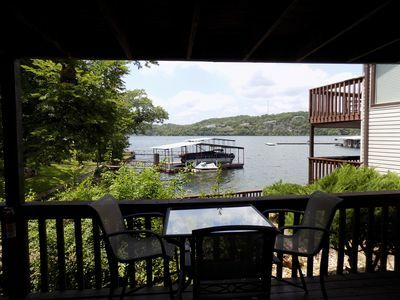 Enjoy relaxing on the private screened in porch that overlooks the entire lakeside. Just off the screened in porch is a separate sun deck complete with gas grill and lakefront hot tub. Enjoy either or both wonderful outdoor settings. 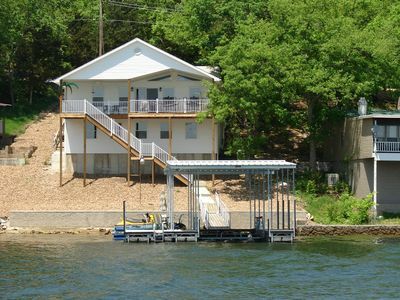 Once you step down to the large dock, you may never want to return to the house. 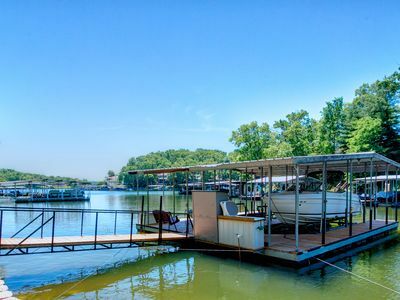 This wonderful dock is positioned perfectly around a great swim platform complete with a swing and picnic table. 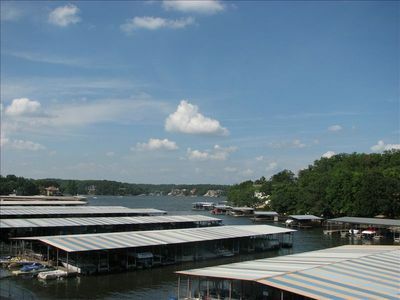 Boaters will love having access to not one but two open boat slips. 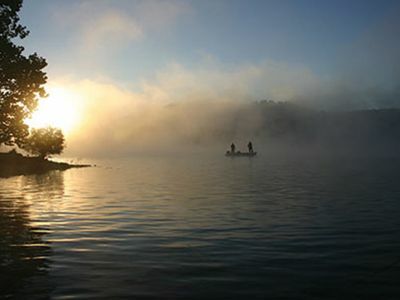 Swimmers will enjoy the deep water and fishing is ideal from either the seawall or dock. 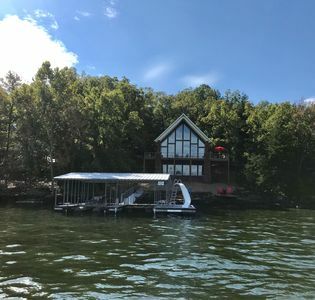 This amazing property is just 5 minutes from the town of Laurie and just 20-25 minutes away from all the action on the busy side of the Lake – Bagnell Dam, Lake Ozarks, and Osage Beach – via the community bridge. 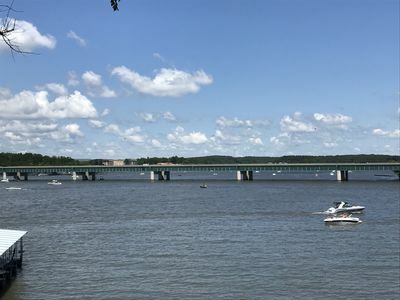 Once you are here plan to take in any number of the Lake's attractions including state parks, theme parks, cave explorations, golfing, go-karts, theatres, bowling, music shows, museums, and of course lots of shopping. 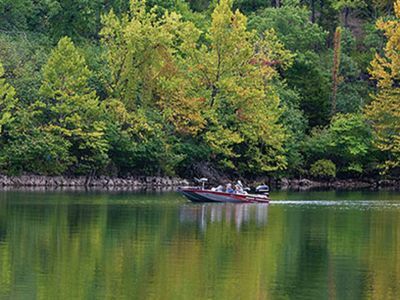 We can help with any of the details of your vacation planning and would be glad to mail out vacation guides, restaurant guides, state park guides, etc. Our hospitality is yours for the asking! 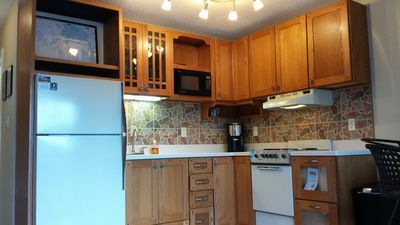 Properties are furnished for normal housekeeping with dishes, cookware, flatware, glasses, grills, and basic appliances. Sofa sleepers are recommended for children’s use only. We are also pleased to provide bed linens, bath towels, and a starter packet of detergents, bath soaps, trash bags and paper products (toilet paper and paper towels). Guests should bring replacements for these starter packet items, your own beach towels, soaps, personal toiletries, coolers, cleaning supplies, camera, life jackets, etc. 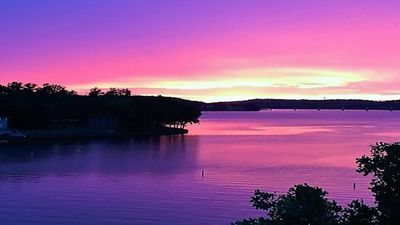 Must See Ledges Lakefront Loft Condo, 4 Queen Beds, Beach, Pools, Wi-Fi, Docks! WOW! Location. Spring is here. Summer dates are filling up. Book NOW! 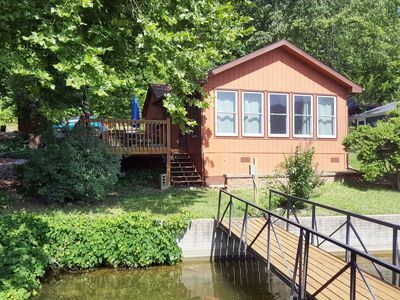 Amazing Location in the Heart of Osage Beach! Even Better View! 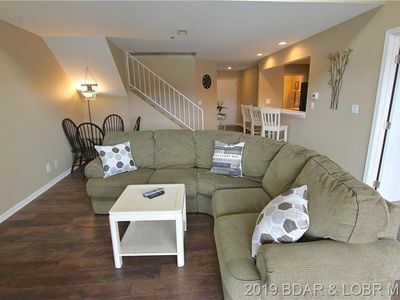 Parkview Bay 3 Bedroom!! 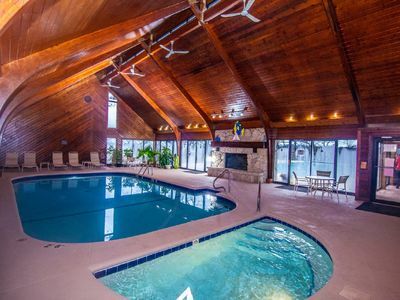 Amazing lake views- 3 pools- Free Wi-Fi!